It’s a bird! It’s a plane! It’s a Jeep® Renegade! 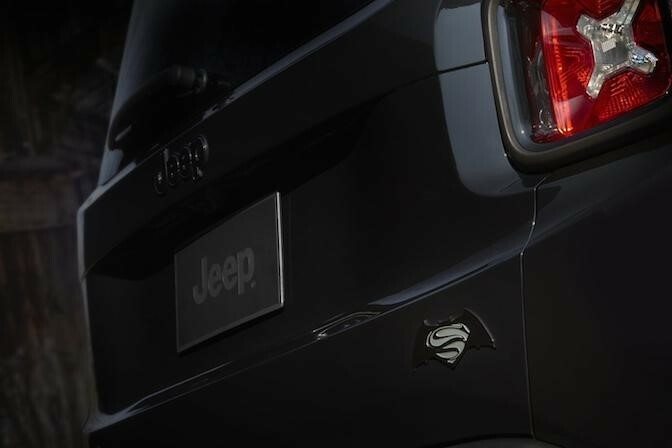 Specifically, it’s Batman in a Jeep® Renegade in the upcoming movie Batman v. Superman: Dawn of Justice. You may have seen the latest Jeep Renegade ad, featuring Bruce Wayne (Ben Affleck) driving a 2016 Jeep Renegade Dawn of Justice Special Edition as Metropolis is being destroyed all around him. The partnership joined FCA US LLC and Warner Bros. Pictures to produce the 30-second spot. Entitled, Into the Storm, actual movie clips highlight the rugged aspects of the Jeep brand’s youngest model, while giving moviegoers a sneak peek at some of what they might expect when the movie hits theaters on March 25, 2016. As you watched the action-packed ad, you probably already noticed – the Renegade isn’t the only FCA vehicle on the Metropolis city streets as Wayne powers through the explosions and piles of rubble. Look closely. “Thanks to an extensive brand and product portfolio, we were able to address every automobile need for the movie including Jeep, Dodge, Chrysler, FIAT, Alfa Romeo and Maserati, and from our sister company CNH Industrial, Iveco heavy-duty commercial vehicles,” said Olivier Francois, Chief Marketing Officer, FCA Global. Just prior to the movie premier, 15-second spots featuring the Dodge Challenger and Durango in chase scenes from the movie will also launch. Waiting another two weeks for the movie to come out in theaters may seem like forever, but you don’t have to wait to order the new 2016 Jeep Renegade Dawn of Justice Special Edition. Visit www.jeep.com to build yours today!